Yeah, folks. If you’re inconvenienced and frustrated by empty public schools, Premier Photo Op may have a solution. She tried it, she likes it. And if you can’t afford the tuition, do something about it – like Christy did. Befriend a few rich folks and get yourself elected. 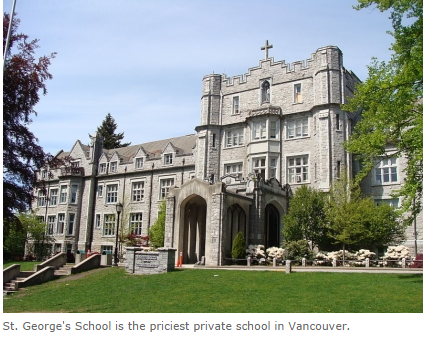 Stephen Hui of the Georgia Straight reported annual fees at St. George’s ranged from $16,085 to $48,250, three years ago. So, not accounting for inflation, your 2.5 kids will only cost $40,212 to $120,625 for schooling. Of course, those fees are not tax deductible so you’re going to need extra pre-tax income of $74,000 to $223,000 just to send 2.5 darlings to Christy’s favourite school for a year. 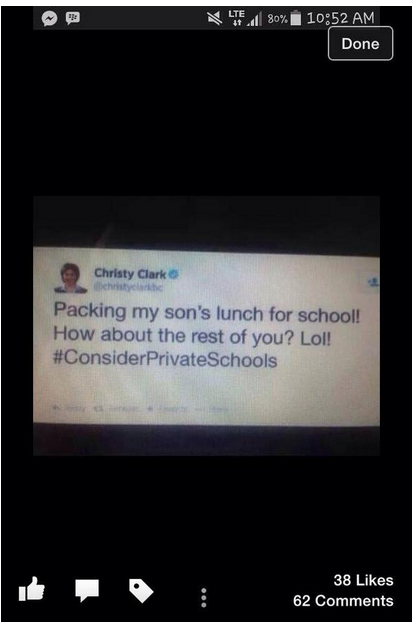 Note: Premier Photo Op’s friends claim the Tweet was a fake; she didn’t actually pack her son’s lunch. Too déclassé. He enjoys hearty breakfasts and four-course lunches, with choices of soup and salad bar, in St. George’s middle school restaurant. Wine not included. Between classes, Hamish and friends enjoy The Saints Café, which provides food and refreshments throughout the day. According to the school, food selections include sushi, chicken caesar salads, deli style sandwiches, fresh fruit and yogurt parfaits, fruit-based smoothies, and much more. Is that factual. I went to her account and that isn't there.. It is not time stamped like all tweets are.. Did you fact check it? It is certainly factual that her son is not missing classes because his private school, partly funded by taxpayers, is in regular session. Gosh, when I was in school (public) we only had monthly hot dog days and the buns weren't even toasted. Not a single vending machine either. We can now add Vaughn Palmer to the lame stream media with the same old arbitration spin joining his fellow brothers in the battle against BC teachers in the media with information meant to scare the public about binding arbitration. Stranger that Palmer, Baldrey, Smith etc all have said almost the identical same thing why arbitration wouldn't work. The propaganda machine is in full swing and BC kids are its targets. Wouldn't you think that one of them would be a little more original. It's like we live in the Twilight Zone with the media. Baldrey, Smith, Smythe, Mason and now Palmer all saying EXACTLY the same thing. Sad day not only for BC kids but for BC democracy. Talk about out of touch with reality ! I know when I went to school in the UK, school lunches were provided for a nominal fee ( about 9d or so comes to mind) in high school (1956 – 1961 time frame). It was a normal government school that catered to the everyday person. Reading the above cost of private education is absolutely obscene. Talk about taking advantage of children – a whole messy, unprincipled industry has sprung up with the children being the pawns or sacrificial lambs – by no other than the BC Liberal government. I can understand the reluctance of the BC government wanting to solve the teachers strike by NOT going to binding arbitration. The record of the BC government (BC Liberals) is shocking and the government just does not want the public to be made aware of their real motives – break the BCTF union and drive down wages to whatever they can get away with. I do believe that the government of BC will rue the day they decided to sacrifice the education of the children to gain political clout and make their rich supporters even more wealthy. It is sickening just how timid the MSM has become under threat from the BC Liberal government – remember how they went after the NDP in the 1980's and later. It certainly appears that BC is being financially raped by uncaring, greedy, self serving entities that care nought about the citizens of tomorrow. Sorry, slightly off topic but relevant none the less. Norm is that for real ? I mean I know she is pretty clueless at the best of times but seriously. Why is that not all over the news. Regardless whether Clark posted it. Im sure she got a great belly laugh over it. She's not the most intellectual student to ever go to SFU or was that the Sorbonne. She's an idiot and everytime she opens her mouth, she confirms it. How's that “recall” petition going in Kelowna? Hound her to the gates of Hell folks. Not surprising. Press gallery is controlled by people whose families are psid by BC govt or their supporters. Free enterprise at work. Palmer, for example has earned more from side jobs than by writing for Van Sun. And the fine fellow/shock-jock who coaxed it out of her isn't now working for the (nolonger) Giant '98. Seems to me the premier does so much tweeting she probably did it and one of her staff of minions (who, according to the Sun, spend at least part of their working day playing with bloggers in their underwear on the internet) managed to delete the thing before it got more widely circulated. I've been going over her expense accounts for the 2011-12 fiscal year and trying to figure out how much she charged the province for her high profile on the 'social media' ladder….quite a few unexplained costs their – I mean, ignoring the jewellery and almost $800 for shredding. Shredding? …..How do you cost that out Norm? Fassbender just rejected arbitration. The BC government won't arbitrate, won't legislate and won't mediate. What happens to kids and schools now? Your opinions please. The only solution I can think of is a GENERAL STRIKE. Liberal friendly reporting/ under reporting distorting public perceptions.A province of distortions.? What a wacky weekend. First we have Fassbender saying no to third party negotiations. Meanwhile what does he consider Peter Cameron to be? Of course Cameron would say no as he’d be losing thousands of cash for doing you know absolutely nothing at Factbender’s behest. Then we have the village idiot saying he wants to um negotiate hard (Clark’s oldbuzz word) but all that means he wants to run and hide so he can keep the cash and see that your kids never see the light of day in a classroom this fall. Then we have the MSM again spouting the exact same story (they must read each other’s minds – not much to read there with the limited intelligence they have) about the doctors years ago as the no no for arbitration. Then we now have the MSM with the confusing titles. BC wants arbitration. As if it’s all of us. The GOVERNMENT is at fault but hey never accuse Clark of being in bed with the MSM. She might be forced to admit it. What a bunch of fools do you think the public is? BTW don’t you think it’s just a tiny tacky for Clark’s ex Marrisen (plus a troll friend) to be on twitter attacking child singer Raffi for supporting teachers and kids? When Raffi is seen as the enemy boy we’ve got them on the run? Next week who knows? They might be after some Sesame Street character for being too pro teacher. Only in wacky BC…. You mean “Drex” the shock jock? He's now working for CKNW………….. If they keep churning, eventually they'll dump Ian Koenigsfest. The first sign will be him receiving a lifetime achievement award from the RTDNA, where he serves as President. Surely there's an ambitious BCIT undergrad ready to work for a fraction of the wages while skippering this sinking barge. The court decision was clear. You'd have to be an idiot to not understand what it says, yet here we are, with the b.c. lieberals doing it all over again. In my opinion, the B.C. lieberals don't want a settlement. If tomorrow morning the BCTF said they agreed to the government's proposals, the lieberals would ensure there was not singed contract for at least another few months. By that time parents will be frantic and that is when the B.C. lieberals will engage in “shock doctrine” tactics. We have seen the start of it by giving parents $40 a day. By Nov. expect the B.C. lieberals to start floating the American voucher system for B.C. schools. Many parents will accept it and the BCTF will be history. Then you can expect the B.C. lieberals to go after the health care unions and finish what el gordo started. The Nurses Union will be next and with all the P3 hospitals being built, we won't have to wait long. The Bilderberg group must be very proud of the b.c. lieberals. crunchy has picked up where el gordo left off. B.C. government in debt for $150B declares bankruptcy after Supreme Court of Canada awards BCTF and B.C. teachers settlement of $5Billion.